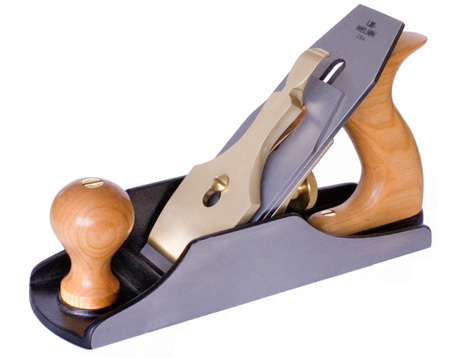 I know that many woodworkers, both those new to the craft and even some who have been around for a while, might like to have some subtle instruction to improve their results when using a smoothing plane. After setting up the sharp blade, many would think the remaining aspects of plane use would be without issue. From my experience, this is not always the case. Through time spent demonstrating and talking with other woodworkers, certain issues are common and recurring, so perhaps I can provide assistance. At many shows, I’ll set up a plane to take a shaving that is somewhere between 1 and 2 thousands of an inch, in order to demonstrate just how sharp the blade is. After I take some shavings, I’ll hand the tool to one of the attendees and let them see how it feels to use a sharp tool. What I’ve noticed is they often push the plane across the same board and the blade barely touches the wood, if at all. This tempts them to adjust the blade so that it is protruding further than necessary. The reason this is happening is the subtle pressure difference between what I was applying in a downward fashion, and the lack of pressure applied to the plane by the attendee. I will actually utilize this pressure control when planing a board or panel. I find I can set the blade for a relatively light cut and adjust to either a slightly thicker shaving or a lighter shaving simply by adjusting the pressure I apply to the plane. The lightest shaving is obtained with the majority of the force applied across the board as if I’m making the plane just slide on top of the board. To take a slightly thicker bite, the pressure is about half way between the light shaving and full force downward. You could think about this as if you were drawing a line starting from the edge of the board and going down and away at a 45 degree angle. This is the direction I envision applying the force for the thicker shaving, as if I were following the line down the line at 45 degrees. One other issue relating to setting up the plane’s blade. If you can see the blade, when sighting down the sole, there is a good chance the blade is not sharp enough (a sharp edge is the intersection of two surfaces at a point, which will reflect no light) or will be very difficult to use, as it will take a very thick shaving. When we set up the smoothing plane’s blade at our shows, we are normally setting it for a very light shaving, using a small piece of wood to engage the blade. It’s surprising how little blade is actually protruding when the blade is set. Most of the people I’ve dealt with at our shows can not even see the blade, including myself, when sighting down the sole. I hope this helps increase your enjoyment when using a smoothing plane. Hmmm… what’s your reaction to this video by Paul Sellers? I find my experience matches his with respect to planing technique. I was first taught 20 years ago by a professional woodworker to “bear down” on the plane. It worked okay, but I found it tiring, especially when I switched to purely hand tool woodworking. Paul’s methods were a breath of fresh air to me and work for me.